(Washington, D.C.) – Fast food workers in many parts of the country today intend to walk out on their jobs in protest of low wages. Press reports indicate these workers support a doubling of the minimum wage to $15.00 per hour. This walkout – which is financed by the Service Employees International Union (SEIU) – is the most recent in a series of strikes in major U.S. cities. Supporters of the minimum wage increase for fast food workers say a higher salary is more important now because while fast food jobs used to be primarily taken by teens, many workers are now older and supporting families. Small business advocates argue that raising the minimum wage has the effect of forcing employers to increase their use of technology to replace personnel, reduce employee hours worked, or cut costs in other ways. “While the struggle of these workers to make ends meet is legitimate, their complaints are aimed at the wrong target. Minimum wage increases come at a cost to job creators who will inevitably pass the economic burden on to clients and potential employees. Empirical research shows that such increases tend to reduce employment of the very ones requesting higher wages. The best way to get employers to raise wages is to create more jobs, grow the economy, put more money in the pockets of consumers and decrease regulations like the Affordable Care Act that are causing restaurants to lay off workers and cut hours. The LIBRE Initiative is a non-partisan, non-profit, national grassroots organization dedicated to informing the U.S. Hispanic community about the benefits of a constitutionally limited government, property rights, rule of law, sound money supply and free enterprise through a variety of community events, research and policy initiatives. Latinos have been disproportionately hurt by the economic downturn suffering from higher levels of unemployment and poverty. Our aim is to equip the Hispanic community with the tools they need to be prosperous. Connect with us on Facebook at The LIBRE Initiative and @LIBREInitiative on Twitter. Visit: www.thelibreinitiative.com. Tempe leads the East Valley in crime, taxes and city costs, except for Mesa’s water and solid waste disposal charges. In those two cases Tempe places second in costs behind Mesa. Tempe has a serious crime rate that is considerably higher than the rest of the East Valley. Tempe officials continually blame Arizona State University for city woes, but I find it hard to believe the 35,000 or so students that attend classes at the Tempe campus are the culprits for all of Tempe’s fiscal and crime problems. In the May, 2011 East Valley Tribune column, Tempe should spend less, cut more before raising taxes, it said “If Tempe spent per resident what Mesa spends on policing, they’d save taxpayers over $14 million a year.” Those savings would pay for the new dam in two and a half years. Even with reduced spending, Mesa continues to have a significantly lower crime rate than Tempe. Until the residents step up and demand accountability and transparency the Tempe leadership will continue to act like it has money to burn, your money to burn that is. In one of the most egregious abuses of it regulatory power, the EPA is forcing the Navajo Generating Station (NGS) located near Page, AZ to make unnecessary and costly modifications to the generation facilities that would have no measurable effect on emissions in the region. Using the Clean Air Act as its regulatory authority, the EPA claims that emissions from NGS are contributing to haze in the Grand Canyon area and in February of this year, proposed a regional haze restriction that would require NGS expenditures of $1.1 billion on additional emission reduction controls. This claim also ignores the fact that prevailing winds in the region result in plant emissions being blown away from the Grand Canyon, not towards it. At the same time the EPA issued their ruling, a U.S. Department of Energy study concluded there would be no visibility improvement at the Grand Canyon after the controls were added. Why would the EPA pursue such a expensive and punitive rule when it would have no perceptible effect on haze at the Grand Canyon? Opponents of the EPA action are reporting that the EPA doesn’t care about haze at all. They say what the EPA really wants is to provide a precedent for shutting down coal-fired electric generating plants. The Obama administration has a stated objective to reduce carbon emissions and last year attempted to implement a “cap and trade” approach to regulating fossil fuels. Republicans in the US Congress voted down the enabling legislation, with some calling it a “war on coal”. Why is the EPA going after NGS and why is NGS so critical to Arizona? The Navajo Generating Station was constructed at a cost of $650 million beginning in 1970 and ending in 1976 when the last of the three generating units was completed. The project was sited in its current location based on readily available coal fuel, a reliable source of water for cooling and the proximity of the city of Page which could provide for many of the project’s infrastructure needs, including an available skilled labor pool. The plant is located approximately 100 miles northeast of the Grand Canyon. The primary purpose of the NGS was to provide power to support the Central Arizona Project (CAP) which is responsible for supplying Arizona’s share of Colorado River water to central and southern Arizona. To get water from the far northwest corner of Arizona to the rest of the state, CAP built a network of pumps, pipelines and and surface canals over 336 miles in length to transport Arizona’s annual allocation of 1.5 million acre-feet of water to Maricopa, Pima and Pinal counties. The pumps must raise the water over 3000 feet to allow it to flow into central Arizona. The majority of the power generated by NGS powers the CAP pumps. NGS has a long history of taking a proactive approach to emissions reduction. In 1999, NGS completed a $420 million retrofit that reduced sulfur dioxide emissions from the plant by 90%. In additional overhauls conducted between 2003 and 2005, electrostatic precipitators were overhauled for reliability and performance gains. In 2007, the Salt River Project, the plant operator, conducted studies on how to reduce nitrogen oxide emissions to reduce haze in the region and voluntarily installed emission reduction equipment on each of their three plants between 2009 and 2011. Apparently, the best efforts of NGS were not good enough. The EPA rule proposed in February is one of the most stringent regional haze rules in the entire nation. It imposes a standard that is more rigorous that the standards for a brand new coal plant. At the 1600 megawatt Prairie State Energy Campus which first came online in 2012, the permitted level of NO emissions are 0.07 parts per million (ppm) while the standard for NGS, a 37 year old plant, is 0.055 ppm. In an attempt to find a reasonable middle ground, a working group consisting of the EPA, U.S. Department of the Interior, the Salt River Project, the Central Arizona Water Conservation District, the Environmental Defense Fund, the Gila River Indian Community, the Navajo Nation and the Western Resource Advocates began negotiations to find a “Reasonable Progress Alternative” to the BART rule issued by the EPA in February. These negotiations were closed-door sessions and while the working group included non-stakeholder environmental activists like the Environmental Defense Fund, they did not solicit or accept input from important stakeholders like the Arizona Corporation Commission, which is the primary regulatory body for energy and water resources in the state. Arizona’s Attorney General was also excluded from legal review and comment on the proposed agreement. Under the proposed settlement, visibility standards and haze causing nitrogen oxide standards are not even addressed. However, in one section of the proposed agreement, the Department of the Interior makes commitments to reduce or offset carbon dioxide emissions by 3% per year “in furtherance of the President’s 2013 Climate Action Plan”. It further states that “This commitment is intended to accomplish two aims: reduce carbon dioxide emissions and demonstrate the workability of a credit-based system to achieve carbon dioxide emission reductions” (emphasis added). This action by the Department of the Interior and the EPA essentially unilaterally implements “cap and trade” at NGS even though they do not have Congressional authority to do so. The working group proposal also calls for the early shutdown of one generation unit in 2020 or the equivalent reduction of output equal to the closure of one unit from 2020 to 2030. There is no consideration in the plan for any increased cost in replacement power or an increase in water rates due to those increased power costs. While clearly not a great deal for SRP, the Navajo and CAP, why are they supporting it? The original rule issued by the EPA would have imposed the most stringent nitrogen oxide standards in the country and would require retrofits to the generating plants at a cost of over a billion dollars. Had that rule been implemented, the economic viability of the entire plant was in jeopardy. The Arizona stakeholders felt that the EPA was holding the plant hostage under its rule-making authority. They felt that the working group agreement was probably the best deal they could get under the circumstances, enabling them to keep the plant going at least until 2035. Unfortunately, the working group agreement has some fairly large holes in it. Many of the commitments made by the Department of the Interior may require Congressional action to implement. In the current belt-tightening by the federal government, Congress may not be willing to fund the $100 million in commitments made by the Department of the Interior. Furthermore, the agreement anticipates a dramatic increase in water rates, but make no provision for it. In addition, it does not address the loss of jobs, economic benefit and tribal revenues that will result from the terms of the agreement. A critical reading of the proposed working group agreement seems to indicate that these regulations are not about reducing regional haze. There is no meaningful reduction of nitrogen oxide in the proposed agreement. Instead, there is a focus on carbon dioxide emission reduction. Carbon dioxide is an odorless, colorless gas and has no impact on visible haze. In addition, the agreement is an apparent attempt to unilaterally implement a “cap and trade” system for regulating carbon emissions for which the Department of the Interior and the EPA have no statutory or regulatory authority. Finally, it appears to be a blatant EPA attack on coal-fired generating plants with the full support and encouragement of environmental activists. Is the EPA doing all of this for a reduction in haze that the federal government’s own study said would be imperceptible to the human eye? More likely, the haze standard simply gives the EPA the opening they need to accomplish their real objectives of shutting another coal plant and promoting Obama’s energy agenda. EPA overreach? Good energy policy? The right choice for Arizona? You decide. The public comment period on the proposed agreement will close on October 4th, 2013. TUCSON, Ariz. — Tuesday August 27th, Tucson City Council Candidate Mike Polak won the Republican Nomination for Ward 5. In the city of TucsonWard 5 is one of the poorest areas and right now is in desperate need of real leadership. Citizens all over Tucson will have the chance to vote for Mike Polak on November 5, 2013 when the election is held for the general election. For Mike’s part he is excited to give Tucson residents a choice for a better Tucson. Mike now faces incumbent Richard Fimbres in the general election, which switches to a citywide vote. “I would like to thank the voters of Ward 5 who voted for me in the primary election,” Mike stated. “I would like to also thank James Kelley for his efforts up to the primary, and I look forward to working with my new team for the general election,” Mike continued. About Mike Polak: Mike is a veteran of the U.S. Marine Corps, an aerospace engineer with 20 years experience, a multi-national, multi-modal transportation expert and a small business owner. He currently lives with his wife and daughter in Tucson’s south side. We Must Stop Amnesty! But, is anybody even asking for it? You see, the left has been doing this for years. Disagree with something they want and they scream “RACIST!” at the top of their lungs to the offending conservative knowing that because no one wants to be called a racist, you will simply shut up. Well, we all know that quit working a long time ago, but you still hear it from the left. Now a small group from the loud extreme right has adopted this tactic using the word “Amnesty!” They know that no elected official, or any conservative political candidate wants to, in any way, be associated with the word amnesty so they shout it loudly and often in an attempt to halt any discussion of anything that resembles meaningful reform of our broken system of immigration and border security. What they have accomplished during this time is they have stopped anything from happening that would either secure our borders or do anything about the millions of undocumented people living within our borders. They have left our borders wide open and delivered a virtual amnesty that the causes the continuation of lawless behavior. Case in point is the Gang of 8 bill from the U.S. Senate. While no where near perfect, it is certainly a good starting point for discussion when the House comes back into session next month. And, it is certainly not amnesty. Like the word racist, let’s save the word amnesty for a case where it truly applies. Let’s give the word back some meaning and power. For those on the extreme right who want to continue screaming “AMNESTY” at every conceivable moment, I would suggest you take a look at MSNBC when they are screaming “RACIST” at every person who dares to criticize Obama’s economic policies. That will give you a real image of just how foolish you sound and how meaningless your argument has become. Editor’s Note: Re-posted from TexasGOPVote.com with author’s permission – original link. Bob Price is a political commentator for TexasGOPVote.com. He is an expert about issues related to border security and illegal immigration and has expanded to cover stories of local, state and national interest from a Conservative Texas Perspective. He also volunteers with US Border Watch, a civilian volunteer border security organization, as Communications Director. He has been with USBW for over six years. Price is a Life Endowment Member of the National Rifle Association. Recently, Price became the Texas Director of Cafe Con Leche Republicans. CCLR is an organization established to foster better communication within the Republican party toward immigrants. The Arizona Family Project is pleased to announce its Friend of the Family award winners for 2013. Given at the end of each legislative year, the Friend of the Family award is given to State Legislators who have demonstrated, through their voting record and personal action, a strong commitment to strengthening Arizona’s families and to promoting pro-family values and ideals. Compared to 2012, 2013 was a quieter year, and much of the good that was done was spoiled at the end of the year by a battle over Medicaid Expansion that resulting in normally pro-life legislators ignoring the concerns of the pro-life movement in order to pass a bill. Nevertheless, good bills were still passed and there were a large number of legislators who deserve recognition for their hard work. The Arizona Family Project is a 501(c)(4) non-profit organization, dedicated to raising awareness of pro-family issues and increasing participation by Arizonans in advocating for and advancing pro-family positions. The Arizona Family Project has given the Friend of the Family award every year since 2003. Rob Haney, immediate past chairman of the Maricopa County Republican Party, has endorsed Andrew Thomas for Governor. Rob is widely known as the chief conservative grassroots leader in Arizona. He explains why we need a Governor who will stand up to a Republican establishment that has given us Obamacare, broken borders, and disregard of our immigration laws, and why Andrew Thomas is the only candidate who will do this. Seventeen years experience dealing with the “Top-Down” direction imposed nationally by the Republican Party elites and in Arizona chiefly by Senators John McCain and Jon Kyl, is why I support Andy Thomas for Governor. Andy Thomas has a proven track record of supporting and defending the U.S. Constitution and the Republican Party Platform, and he carries the arrows and battle scars that come with that fight. I have served as a precinct committeeman, State and County Member-at-Large, two terms as Legislative District 11 Chairman and two terms as Maricopa County Chairman. When I stood up and exposed elected Republican officials for not following the Republican Platform or the U.S Constitution, I was attacked by the McCain-led Republican establishment. No effort was spared by this group to silence me and others who dared to challenge the McCain ruling cabal. This cabal consists of the politicians, Chambers of Commerce (business owners who depended on the cheap labor of illegal aliens to staff their operations while we pay through our taxes for their benefits), columnists, radio hosts, lobbyists, bloggers, the “Interfaith-Social Justice” liberal class, and the agenda driven liberal lawyer class. More here. What I experienced was nothing compared to what the McCain cabal had in store for their primary targets: Senator Russell Pearce, Maricopa County Attorney Andrew Thomas, and Maricopa County Sheriff Joe Arpaio. These were the three stalwarts who stood for the “rule of law,” represented the Republican grass roots, and most significantly for the McCain surrogates, opposed the illegal alien invasion. These three had to be stopped or the rest of the country would be tempted to replicate the Arizona actions that addressed the illegal invasion. Have you ever known a more direct campaigner than Andy Thomas? I have not. Andy tells you his core beliefs, what he represents and the actions he will take once in office to correct government failings. Others will equivocate about the issues, lie about their true beliefs, and avoid addressing the issues once in office. Andy Thomas will not prevaricate. From my experience, I know who the good guys are in the Republican Party and who the bad guys are. Andy Thomas wears the whitest of the white hats. In the Republican Party, we have a large quantity of “bipartisan” joiners with the Democrats. We have very few fighters for the conservative side of an issue. Even Rubio and Christie, whom we believed were with us, have shown their true colors when they flipped using the “patented” McCain Flip-Flop. We know that Andy Thomas is a fighter representing the base of the party and there will be no flip from him and his record proves it. It is clear to me that our judicial branch of government no longer fulfills the original intent of our Founders in interpreting the law while being the least powerful branch of government. They are now not only the most powerful, but hold veto power over all conservative initiated legislation when their liberal friends in the ACLU file suit to stop conservative passed legislation. They wield this power with a liberal bent worthy of their liberal education and the liberal dominated American and Arizona Bar associations to which they belong. Judges are selected from this liberal dominated class of lawyers. It is no surprise to me that these lawyers attacked Thomas where they could dominate the proceedings. It is also no surprise that everyone from the Maricopa County Republican Committee to conservative columnist Michelle Malkin to even liberal writers at the Arizona Republic denounced the attack on Andy Thomas. A panel from the Arizona Bar pulled Andy Thomas’ law license. However, the federal Grand Jury (which is so noted for the ease of securing an indictment on minimal evidence that the term “they would indict a ham sandwich” refers to the Grand Jury) which looked at the same case at the request of the Obama Justice Department refused to indict him or Sheriff Joe Arpaio for lack of evidence. The Grand Jury is made up of the non-lawyer class and rejected as insufficient the same evidence the lawyer class used to pull his license. What does that tell you about how out of touch, liberal and dishonest our courts have become? The Republican and Democrat ruling class consider Thomas dangerous because they know that once elected he will keep his campaign promise to attack corruption by both the Republican and Democrat office holders. The “cabal” will devote a great amount of money and effort to defeat him. They have started with “He can’t win” (because of all the baggage from their charges). The Republican establishment also stated that Senator Cruz of Texas was not able to win. But he did, and now is our most effective conservative advocate in the U.S. Senate. Andy Thomas won the only straw poll in the race so far, by ten points over his closest competitor. The poll was done by a web site that opposes Andy’s candidacy. He is picking up signatures and $5 Clean Elections contributions from voters with amazing ease. I know because I have been at the meetings collecting them for him. We are not going to reverse the slide into oblivion by the Republican Party by selecting the same type of liberal leaning, milquetoast Republicans for our candidates. If we do, we will get promises to seal the border, enforce immigration laws and oppose Obamacare. But we would only continue to see their promises reversed and conservative principles abandoned while they surrender to Democrats and yet claim victory through bipartisan legislation. This legislation always moves the political spectrum to the left. Don’t you think fifty years of this process is enough? Which is easier to take, a dagger to the chest from a Democrat governor or one to the back from another McCain-supported Republican governor? But there is another choice. That is why I will vote for Andy Thomas as governor, secure in the knowledge that our laws will be upheld. You will recall that Andy supported legislation to force judges to deny bond to criminal illegal aliens, he followed the law and prosecuted employers who knowingly hired illegal aliens and he prosecuted illegal aliens as co-conspirators in human trafficking cases. Do you really believe there are only 11 million illegal aliens in the country, that there is very little inflation, that the border has never been more secure, and that the expansion of Medicaid under Obamacare will save us money? Where do our leaders come up withthis malarkey? It is from all the people I described in the second paragraph. Andy has assured me that he will faithfully consult the conservative grassroots of the party as he has in the past. They have been ignored too long and the party has suffered enormously because of it. In our hearts, we all know that Andy Thomas would do the best job as governor. Let’s make sure he gets there. He is running as a “clean election candidate.” You can reach Andy through Facebook (search: “Andrew Thomas Republican” in Facebook to find it) and volunteer to carry petitions and get five dollar donations for him. Please email me at r_b_haney@yahoo.com and volunteer to carry a petition and get $5 donations for him. The Thomas Kick-Off event flyer is linked here. Is It Time for a Hillary Clinton Coronation? In an interview with George Stephanopoulos, Donna Brazile said if Hillary enters the presidential race, we can expect a Hillary Clinton coronation. …if Hillary Clinton gets into the race, there will be a coronation of her, because there are so many Democrats who last time around supported her, who I think are anxious to see her back out there again. We shouldn’t wait for the 2016 presidential campaign to begin for a Hillary Clinton coronation. Let’s nominate Hillary Clinton for Queen of Benghazi and worst secretary of state in modern history, for her disastrous job performance as Secretary of State, culminating in the horror of Benghazi, and the cover-up that followed. Her testimony in Congress demonstrated indifference and insensitivity towards our fallen heroes at Benghazi and their grieving families. The comment “what difference at this point does it make” reminded me of the complete indifference and contempt European royalty often showed towards their starving masses. I cannot help but wonder how the survivors and families of our fallen Benghazi heroes felt when they heard this insensitive comment. I’m sure they’re more interested in getting to the truth than Hillary Clinton’s rhetorical gymnastics to evade responsibility and preserve her chance for the presidency. I blogged recently about Hillary Clinton’s lack of qualifications for Secretary of State, a job usually filled by those with considerable foreign policy and diplomatic experience, often with cabinet level experience as well. Hillary had none of those qualifications, unless we count sipping tea with foreign first ladies. Her successor, John Kerry, is only slightly more qualified for secretary of state than Hillary Clinton. He served as chairman of the Senate foreign relations committee, not exactly the depth of foreign policy and diplomatic experience needed for secretary of state, but at least more than Hillary Clinton’s. Like Hillary Clinton, John Kerry had also never run a cabinet department, though the State Department is one of the largest departments, with far flung embassies, consulates, and offices in almost every nation. You’d think Obama would have learned that foreign policy and diplomatic experience makes a huge difference for a Secretary of State, but Obama still doesn’t ‘get it.’ Initially, Obama wanted to appoint Susan Rice as Secretary of State, but she withdrew after howls of outrage about her own lackluster job performance as UN ambassador, and as Assistant Secretary of State when our embassies in Africa were destroyed. I’d like to propose another coronation: Barack Obama as the worst president in modern history. Jimmy Carter is smiling now, as he’s been surpassed as the worst modern president. Barack Obama is like ‘Jimmy Carter on steroids.’ Jimmy Carter threw our long time friend and ally the Shah ‘under the bus’, in the process creating conditions that led to the Afghan wars, the Iran-Iraq war, and the two Gulf wars. Obama has thrown Mubarak and several other friends and allies ‘under the bus’ and allowed the Muslim Brotherhood to take their places. I shudder to think what lies in store during the rest of Obama’s presidency, as conditions have deteriorated in the region, and should remind us of the Balkans just before World War I, needing only a spark to set off a major war. The sad part about all of this is that the Middle East is burning, Iran is on the verge of becoming a nuclear terrorist power, and America has lost virtually all credibility in the region. The blog Debka reported recently that Obama called Egyptian military leader Gen. Abdel-Fattah el-Sisi, but he refused to take Obama’s call. Apparently el-Sisi didn’t want the same dressing down Obama gave Hosni Mubarak in February 2011, when Obama demanded that Mubarak step down. El-Sisi’s staff offered to transfer Obama’s call to interim president Adly Mansour but Obama refused. For thousands of years in the Middle East, leaders have admired strength, and despised weakness. Obama set a tone of weakness during the first months of his presidency, with an ‘apology tour’ of the world, especially the Middle East. Obama even bowed down to Saudi King Abdullah, which is not the custom. Hillary Clinton continued the apology tour by apologizing for a third-rate video posted on YouTube that our government had nothing to do with producing. 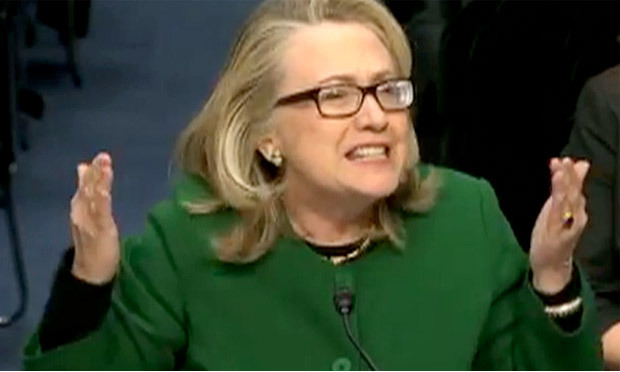 Initially, Benghazi was spun as a demonstration about the video that spun out of control. The apologies were apparently intended to reinforce the spin that Benghazi was nothing more than a demonstration that turned violent, but conveniently after the election it has emerged there was no demonstration, there was an organized terror attack, and the video had nothing to with the attack, and in fact the video was posted months before the attack. Here’s Hillary Clinton and Obama apologizing for something our government had absolutely nothing to do with, implicitly accepting blame for Muslims who were offended by the video. The Clinton years were infamous for numerous scandals, and aggressive tactics designed to cover-up these scandals. All of the same trade craft tactics are evident in the Benghazi cover-up, such as intimidation of prospective witnesses, withholding evidence, and constant spin, spin, and more spin. Hillary Clinton Coronation as President? Unfortunately, unless the GOP gets its act together, nominating a good candidate, and growing the base to include many more Hispanic and Asian voters, Hillary Clinton is likely to become the next president and we will indeed have a coronation!